Time has a funny way of changing your perspective. For example, Realm Of The Trolls was a perfectly acceptable fantasy title back in the late Eighties, but thanks to today’s internet parlance it’s as likely to conjure up images of YouTube comments as it is a deep, dark cavern. 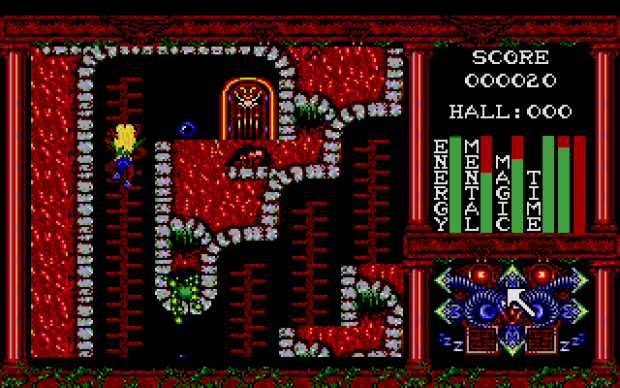 Likewise, with the widespread support that joypads and joysticks have always had, it might seem odd to some of our younger readers that home computer users might play a platform game with a mouse – yet that’s exactly the option I took with Realm Of The Trolls, unusually leaving the joystick to one side. To their credit, the developers at Rainbow Arts paced the game perfectly for mouse controls – there’s some precision movement involved in getting around the game’s lengthy, labyrinthine stages, but it’s a matter of correctly timing your run rather than rapid inputs. It’s also a bit of a design throwback, using ladders for movement between floors in the same manner as Space Panic, rather than the common method of jumping. There’s a sense that Realm Of The Trolls was intelligently constructed around what the system had to offer, rather than the more common approach of sanding the square peg down until it fits the round hole. But of course, all of this is only really apparent to an outsider looking in – and as a player who was enthralled by the console gaming scene during the heyday of the 16-bit home computers, I’m most definitely looking at it from the perspective of an outsider.